The production of Super Dimension-70 feature films, standard 5-perf. 65mm motion picture cameras and accessories are employed. Equipment from Panavision, Arriflex and Fries are most commonly used. Over the years this equipment has been upgraded to mirror their counterpart 35mm gear and constant improvement are being made. 65mm cameras are bigger and heavier than 35mm but not that much to be a significant burden on the crew. Shooting indoors or outdoors provide different cinematography opportunities with lighting being no different than for 35mm. 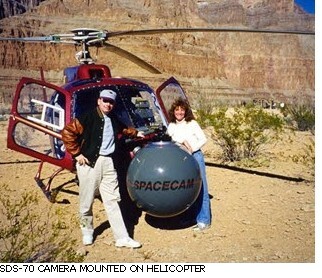 Steadicam, Spacecam and boom mounted 65mm cameras can be rented. A broad variety of lenses are also available from wide-angle 18mm to longer lenses up to 300mm and zooms. The speed of the optics can vary from T2.8 to T5.6 depending on the design and focal length. There are also custom lenses available from specialty houses and Super Vista Corp. that can round out lens requirements. It is always prudent prior to production to test lenses for quality and matching. With the broad variety of film emulsions available from speeds of 100 ASA to 800 ASA there is no reasonable limit to the creative flexibility of the 65mm format when compared to 35mm. In situations where effects cameras are required, such as super high-speed photography, 35mm anamorphic equipment can be used and the film can be seamlessly integrated via 65mm blow-up either optically or digitally. An integral part of the SDS-70 process is the creative flexibility to shoot live action at either 24fps or 48fps depending on subject matter or creative effect. 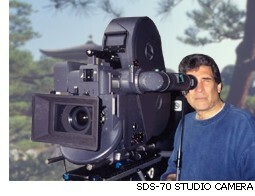 The SDS-70 patented process allows the director to modulate the dimension of the images on the screen. At 24fps the image takes on the "third person" cinematic experience and at 48fps the "first person" in the movie experience is achieved. This effect is quite impressive and can be useful in controlling how much immersive information the audience can experience. CGI effects can be done either at 24fps. or 48fps. depending on creative judgment and budget, the creative opportunities are endless. The cinematographic potential of the SDS-70 process is ground breaking and can only be limited by the imagination of the film maker.